After the expo, Prayers and Portraits, Unfolding the Netherlandish Diptych, was to be seen at the end of 2006, this exhibition traveled in a somewhat altered form and under the title of Flemish Primitives: The Most Exquisite Diptychs to the Royal Museum of Fine Arts in Antwerp. One of the many masterpieces in the expo was the small diptych, or two-panel with the Annunciation of Jan van Eyck (ca. 1385-90-1441) from the collection of the Museo Thyssen-Bornemisza in Madrid. On account of the generous loan, the idea arose for a response in the form of an exposition in Madrid. The head conservator from the Groeninge Museum, Till-Holger Borchert, developed a concept for a small-scale exhibition centered around Van Eyck's Annunciation Diptych: Jan van Eyck: Grisaillas (2009). 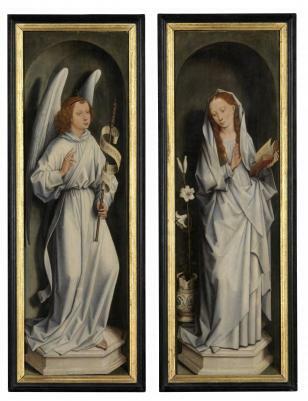 The small diptych is exemplary for the technique of the grisaille, or a painting that literally is made out of grey tones, or out of another neutral tone and that is primarily used to bring about a sculptural effect. The technique began in the 14th Century. Two types were then in usage. The first type, to which Van Eyck's small diptych belongs, is usually found on paintings and is an imitation of sculpture that results in a trompe l'oeil. The second variant comes up in illustrated manuscripts and involves only the figures that are painted in the grisaille style and that are accentuated in this manner by the background-an interior, a landscape or other such cases-that is, however, painted in. The figures in grisaille gain a volume through this and take on something artificial. The 14th and 15th Centuries, the focus of this exhibition, were a highpoint for grisailles. The grisaille was viewed as a separate artistic discipline. Borchert researched the artistic, social and functional aspects of the technique and presented in the small-scale exhibition late-Medieval examples belonging to different media: drawings, paintings, miniatures, ivories and examples on textile bases. A few of the exhibited works came from the collection of the Flemish Art Collection. 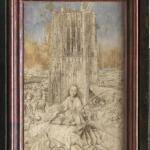 Jan van Eyck's St. Barbara was loaned exceptionally by the Royal Museum of Fine Arts in Antwerp. 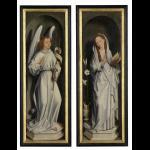 In addition, the two panels with Hans Memling's Annunciation from the Groeninge Museum in Bruges made the trip. For this exhibition, Borchert worked together with the head conservator Mar Borobia and Dolores Delgado from the Museo Thyssen-Bornemisza. The expo is a part of the series Contexts of the permanent collection. This link offers a virtual tour through the expo.